Last week I had one of those vivid dreams that I know must somehow be more meaningful than just the random meanderings of my subconscious. I dreamt that I found a baby girl, but I kept misplacing her. I sat on her while I was driving my car, because I forgot she was there. Then I left her in the car. I forgot her in the bathtub, in the store, and I left her at home without any supervision while I went to work. Every time I realized I had left the baby, I would frantically run to retrieve her. And every time I did, she was always there waiting for me with a huge smile on her face, happy that I had come for her. But then I would just end up forgetting about her a few minutes later. I woke from this dream knowing it was somehow significant, but not understanding why. 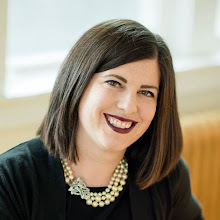 At first I was afraid (quite understandably) that it meant that I was supposed to have another baby and that I was ignoring that fact. But previous spiritual experiences remind me that the three I have are good enough for the Lord, and therefore good enough for me, so I tossed that idea aside and consulted a dream dictionary or two. If you find a baby in your dream, then it suggests that you have acknowledged your hidden potential. If you dream that you forgot you had a baby, then it suggests that you are trying hide your own vulnerabilities; you do not want to let others know of your weaknesses. Alternatively, forgetting about a baby represents an aspect of yourself that you have abandoned or put aside due to life's changing circumstances. The dream may serve as a reminder that it is time for you to pick up that old interest, hobby, or project again. If you find a baby, this is a sign that you are discovering new opportunities and your own potential is being revealed to you. If you dream that you have hidden a baby, or forgotten a baby, this is a sign that you have either been neglecting your responsibilities at work, or neglecting to spend time on yourself. I found this very enlightening, and I'm totally going with it. Because it struck a chord in me. Lara needs a helping hand. Lara needs ten pounds of haddock for her dinner party. Lara needs greater strength and conditioning. Hmm. Maybe it actually is that easy. I mean, I don't need a kidney or a mate, and I'd never serve haddock at a dinner party (sounds way too complicated), and I have plenty of knives...I probably do actually need the rest of this list. But seriously, I think that since having children I've sort of pushed Lara off to the side and totally forgotten about her. I plod through my day out of duty, and even though I do some things that I once loved--like singing--I've forgotten how to let them fill me up because I am like a robot. The other day, as I was passing by Sophia's room, I noticed she had drawn something new on the Whiteboard Easel Santa brought. I stepped into the room to get a better look and what I saw took my breath away. People. My seven-year-old has life figured out better than I do. 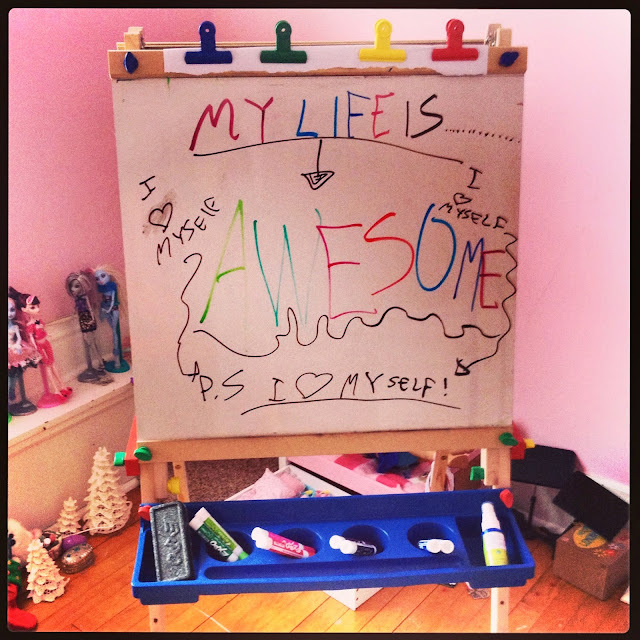 At least, she hasn't yet forgotten that happiness begins with loving yourself and recognizing how awesome your life is. And you know what? I have a pretty awesome life. And since I am on a quest for peace this year, it's going to have to start with learning to love myself again (I promise not to sing any Whitney Houston songs in the process), and learning to stop rushing around in life so much that I forget myself all the time. Look for a new feature soon called "Seven Reasons My Life is Awesome Right Now." A gratitude journal of sorts. Thanks, Sophia. YOU are awesome, and I'm a pretty lucky mom to have you to remind me that life is amazing. 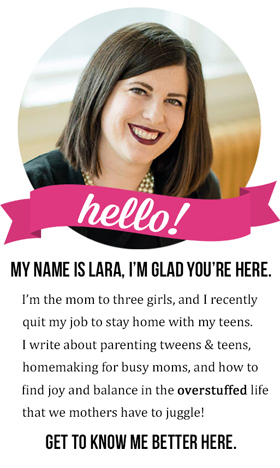 Lara is mom to three daughters—two teens and a tween. 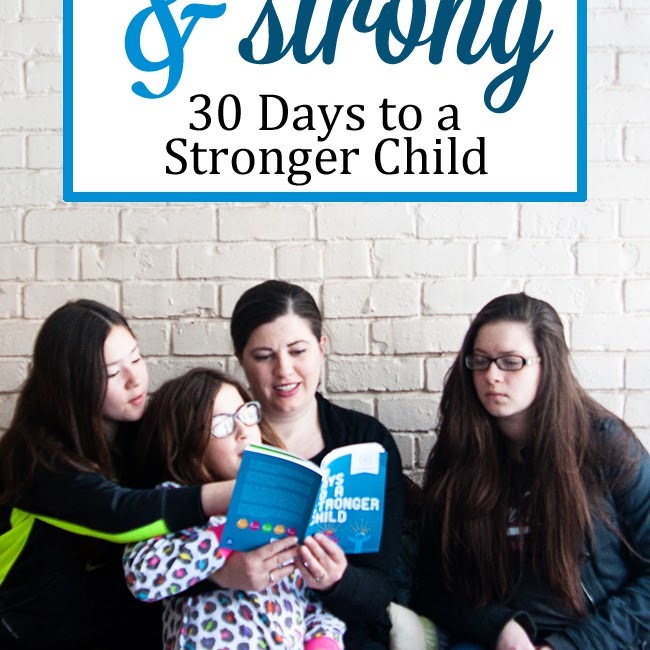 She loves to share her parenting and homemaking triumphs and failures here at Overstuffed! She was diagnosed with Lyme disease in 2015 and has been fighting it ever since. When she isn't working on her mother of the year award, you can find her reading, singing, or taking photos.